For other uses, see FIR (disambiguation) and FIRS (disambiguation). "Fir Tree" redirects here. For other uses, see Fir Tree (disambiguation). They are large trees, reaching heights of 10–80 m (33–262 ft) tall with trunk diameters of 0.5–4 m (1 ft 8 in–13 ft 1 in) when mature. Firs can be distinguished from other members of the pine family by the way in which their needle-like leaves are attached singly to the branches with a base resembling a suction cup, and by their cones, which, like those of true cedars (Cedrus), stand upright on the branches like candles and disintegrate at maturity. Identification of the different species is based on the size and arrangement of the leaves, the size and shape of the cones, and whether the bract scales of the cones are long and exserted, or short and hidden inside the cone. A. alba – the underside of leaves have 2 whitish strips formed by wax-covered stomatal bands; the bases of the needles are shaped like suction cups. Firs can be distinguished from other members of the pine family by the unique attachment of their needle-like leaves to the twig by a base that resembles a small suction cup. The leaves are significantly flattened, sometimes even looking like they are pressed, as in A. sibirica. The leaves have two whitish lines on the bottom, each of which is formed by wax-covered stomatal bands. In most species, the upper surface of the leaves is uniformly green and shiny, without stomata or with a few on the tip, visible as whitish spots. Other species have the upper surface of leaves dull, gray-green or bluish-gray to silvery (glaucous), coated by wax with variable number of stomatal bands, and not always continuous. An example species with shiny green leaves is A. alba, and an example species with dull waxy leaves is A. concolor. The tips of leaves are usually more or less notched (as in A. firma), but sometimes rounded or dull (as in A. concolor, A. magnifica) or sharp and prickly (as in A. bracteata, A. cephalonica, A. holophylla). The leaves of young plants are usually sharper. Firs differ from other conifers in having erect, cylindrical cones 5–25 cm (2–10 in) long that disintegrate at maturity to release the winged seeds. In contrast to spruces, even large fir cones do not hang, but are raised like candles. A. fraseri, A. homolepis (var. umbellata green), A. koreana ('Flava' green), A. lasiocarpa, A. nephrolepis (f. chlorocarpa green), A. sibirica, A. veitchii (var. olivacea green). Wood of most firs is considered unsuitable for general timber use and is often used as pulp or for the manufacture of plywood and rough timber. Because this genus has no insect or decay resistance qualities after logging, it is generally recommended in construction purposes for indoor use only (e.g. indoor drywall on framing). Fir wood left outside cannot be expected to last more than 12 to 18 months, depending on the type of climate it is exposed to. Nordmann fir, noble fir, Fraser fir and balsam fir are popular Christmas trees, generally considered to be the best for this purpose, with aromatic foliage that does not shed many needles on drying out. Many are also decorative garden trees, notably Korean fir and Fraser fir, which produce brightly coloured cones even when very young, still only 1–2 m (3.3–6.6 ft) tall. Other firs can grow anywhere between 30 and 236 feet (9.1 and 71.9 m) tall. Fir Tree Appreciation Day is June 18. Abies religiosa—sacred fir, is the overwinter host for the monarch butterfly (Danaus plexippus). This insect species migrates from central and north United States and south Canada to Central Mexico (Michoacán and Estado de Mexico). During the fall migration, monarchs cover thousands of miles, with a corresponding multi-generational return north. The western North American population of monarchs west of the Rocky Mountains often migrates to sites in southern California but has been found in overwintering Mexican sites as well. Firs are used as food plants by the caterpillars of some Lepidoptera species, including Chionodes abella (recorded on white fir), autumnal moth, conifer swift (a pest of balsam fir), the engrailed, grey pug, mottled umber, pine beauty and the tortrix moths Cydia illutana (whose caterpillars are recorded to feed on European silver fir cone scales) and C. duplicana (on European silver fir bark around injuries or canker). Abies spectabilis or Talispatra is used in Ayurveda as an antitussive (cough suppressant) drug. ^ a b Schorn, Howard; Wehr, Wesley (1986). "Abies milleri, sp. nov., from the Middle Eocene Klondike Mountain Formation, Republic, Ferry County, Washington". Burke Museum Contributions in Anthropology and Natural History. 1: 1–7. ^ a b Seneta, Włodzimierz (1981). Drzewa i krzewy iglaste (Coniferous trees and shrubs) (in Polish) (1st ed.). Warsaw: Państwowe Wydawnictwo Naukowe (PWN). ISBN 978-83-01-01663-0. ^ Schar, Douglas (2015). 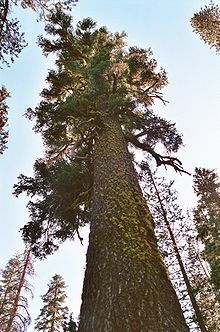 "Douglas Fir, Pseudotsuga menziesii". Archives. Doctor Schar. Retrieved 2015-10-04. ^ Kershaw, Linda (2000). Edible and Medicinal Plants of the Rockies. Edmonton, AB: Lone Pine Publishing. p. 26. ISBN 978-1-55105-229-8. 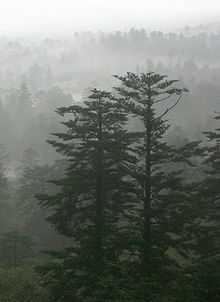 Wikimedia Commons has media related to Abies.